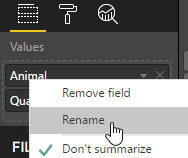 For some time now you've been able to change the name of a field by right-clicking in the field well. To access the field description, right-click in the list of fields on the right-hand side (and not in the field well, as you might expect). You can then choose Properties. This seems wrong to me. Microsoft have bent over backwards to avoid separate pop-up properties windows, so why give in now? 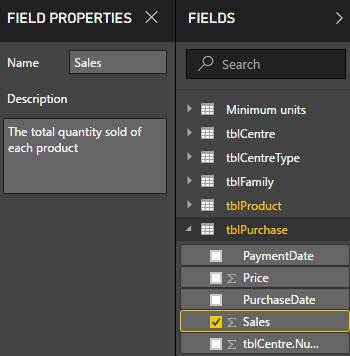 Here we've selected the Quantity field, and renamed it as Sales. We've also taken the opportunity to type in a description for the field. You can see more details about what the field is used for. 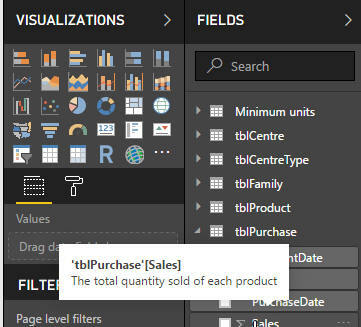 However, this description doesn't show up when you hover over the field in a visualisation, so it's purely a way to show users of your data model what your fields and measures mean. 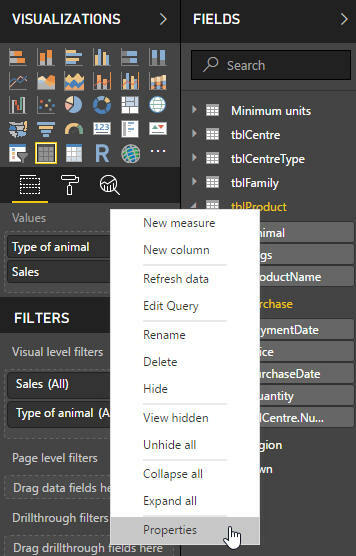 The best use of field descriptions is to tell your users what measures that you have created do, so it's unfortunate that at the time of writing there is a bug in this feature which prevents it working.